I haven't used my Apache Labs "Hermes" Board for Transmit much since I purchased it a few years ago. I've most just used it for a multi-band CW Skimmer Receiver. I've been starting to build it up for use as a Transverter "IF" and I'm noticing some odd behavior on 6m (50 Mhz) which doesn't occur on HF bands at all. When I key up on CW or use "TUN" on 6m there's a Sweep to the RF output. You can see an example of this below where it's sweeping on 6m, and NOT on 10m. In the images below there are some 'other' artifacts which occur on my primary radio in the presence of strong local RF. That is not the 'sweep'. I'm talking about the RF shift noted in the lower box of the 6m image, and not seen in the 10m image below it. I've also noted that when I reset the 'database' in PowerSDR that until I turn off PowerSDR the first time, 6m behaves just like all the other bands. (At least I'm pretty sure of this). 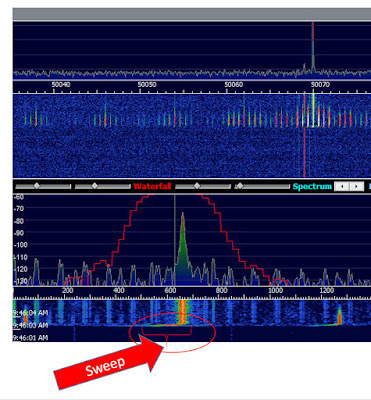 On subsequent restarts of PowerSDR the little sweep, and reduced output on 6m is observed. I thought at first that it was my 5vdc supply dipping in power. But it's not. So I'm just a bit confused by what's happening. Anyone with ideas please comment below. 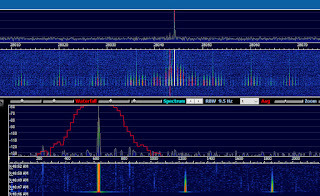 These images of screen shots of HDSDR where my FTDX-5000 is connected to an AirSpy and SpyVerter via it's 9Mhz IF out. Note the 1KHz shift in the first image. 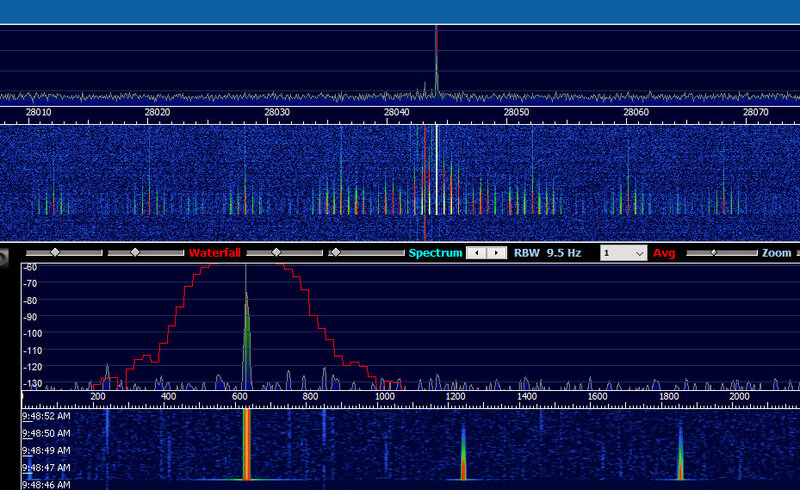 Note the little "1KHz Sweep" at TX start, it can be see in the LOWER box above at the bottom of the image. Note on 10m no little "Sweep"
So turns out this is related to a software 'thing'. I had set Hermes Sample rate at 384K, instead of the default 192K. I discovered this after I reset the 'datebase' a few times, and fiddled with settings until I found the one that made a this happen. Apparently this is sort of a known issue, and I'm not supposed to use 384K until they've resolved the Ethernet up to 1Gb instead of 100 Mb. So for now I'm using all the other settings I had set, except I've reverted this setting back to 192K. And it seems to work fine on 6m now.